The very mention of Lucknow, which is also known as Awadh, brings to mind the tradition of “pehle app” (after you) , the language dripping with politeness and the lifestyle of the nawabs. But what appeals most is the cuisine of Awadh famous for it high standards of gastronomic etiquette still preserved in the current aristocracy and the famous “bawarchis” (cooks) who with perserverance and tremendous discipline continue to follow traditional style of cooking , handed down to them by their ancestors . The Bawarchis NEVER compromised on the quality. Their regular experimentation in the royal kitchens gave the Awadhi cuisine a new height of finesse and dimension. Nawab Wajid Ali Shah , the last Nawab of Awadh , was a great lover of art, culture and cuisine . It was during his period that several “bawarchkhanas ” (kitchens) flourished owing to the high degree of culiniay skills of the cooks who competed with each other to cook the exquisite delicacies , to their master’s desire and liking. The Rakabdars (Gourmet Cooks) laid out Dastarkhwan,a Persian term, meaning an elaborately laid-out ceremonial dining spread. It is customary in Awadh to sit around and share the Dastarkhwan. The richness of Awadhi cuisine lies not only in the variety of cuisine but also is the ingredients used in creating such a variety. The Chefs of Awadh transformed the traditional dastarkhwan with elaborate dishes like kababs, biriyanis, kormas, kaliya, nahari-kulchas, zarda, sheermal, roomali rotis, and parathas. The most frequent method used in Awadhi cooking is the “Dum Pukht” Dum means to breath in and Pukht stands for to cook. The Dum Pukht involves placing semi cooked ingredients in a traditional “Degh” or “Handi” (cooking pots) sealed with dough to trap the steam . It is then slow cooked over glowing charcoal fire to simmer in its own juices until tender and delicious. The essence of Dum cuisine is the excellent aroma, fragrance, flavour and texture developed during the slow cooking process , thus imparting a unique and distinctive character. Zari brings you the true essence of this magnificent cuisine for you to try out . Our chef Parveen who specialises in the Awdhi Cuisine has three generation of his family who have mastered the art of Awadhi Cuisne. 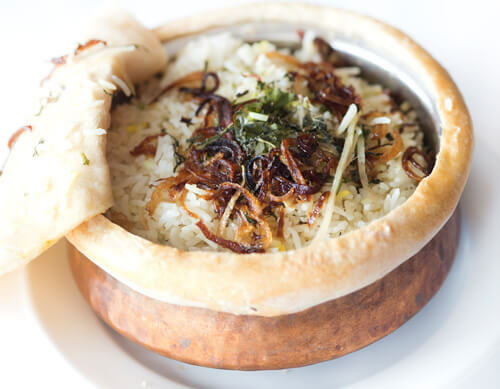 We are giving away one of the best kept secret of Zari in the form of a Dum Pukht Briyani recipe for you to try at home! Enjoy the cooking!!! 1. Heat a medium-size pan on low to medium heat, add the ghee. Once the ghee has melted add the whole spices (the cinnamon stick, bay leaves, cardamom, cloves, mace and star anise) and stir for a couple of minutes or until they are roasted in the ghee. 2. Add the finely chopped onions and salt and stir until the onion is golden brown in colour. Add the ginger garlic paste and cook for about ½ a minute. 3 Add the ground spices (turmeric, chilli, coriander, cumin powders) and stir for a few minutes to cook the spices and making sure not to burn the spices. Add the yogurt to the onion and mix well. Make sure to stir regularly to stop it from burning and settling at the bottom of the pan. 4. Add the chicken and cook for 15 -20 minutes, stirring regularly. Set aside the cooked chicken.